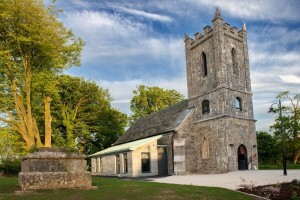 Kilkishen Development Association, chaired by Mike Hogan, undertook this project to restore the Kilkishen Church of Ireland building and develop the building into a Cultural/Heritage Centre for use by all the community and visitors to the area. 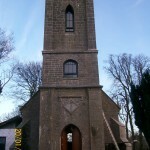 The church was erected in 1811 as a place of worship for the local Church of Ireland Community. It was funded by a grant of £800 from the Board of First Fruits. The church closed in 1964 and it remained vacant and in a state disrepair until it was purchased by Kilkishen Development in 2013 from the Church of Ireland Representative Body. 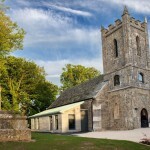 The Church of Ireland Representative Body have retained ownership of the surrounding burial grounds while Kilkishen Development has assumed the responsibility for the maintenance of these grounds. Initially a planning team was put in place to develop this project. A Feasibility Study of the building was carried out by Stanford Architects Ltd. with the help of a LEADER grant and plans were drawn up. Following on from this feasibility study applications were lodged for planning permission & grant aid. The project was put out to Tender & the successful contractor was Taaffe Construction Limited of Murroe, Co. Limerick. 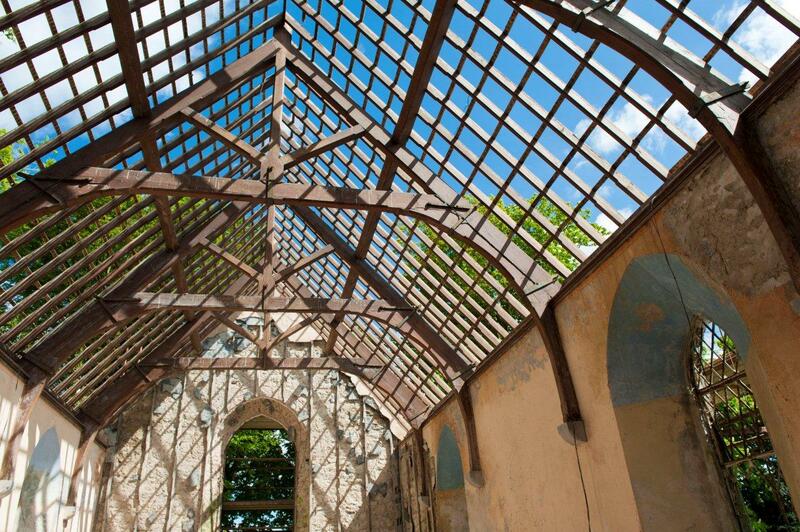 With everything in place, restoration work was able to begin onsite in March 2013. 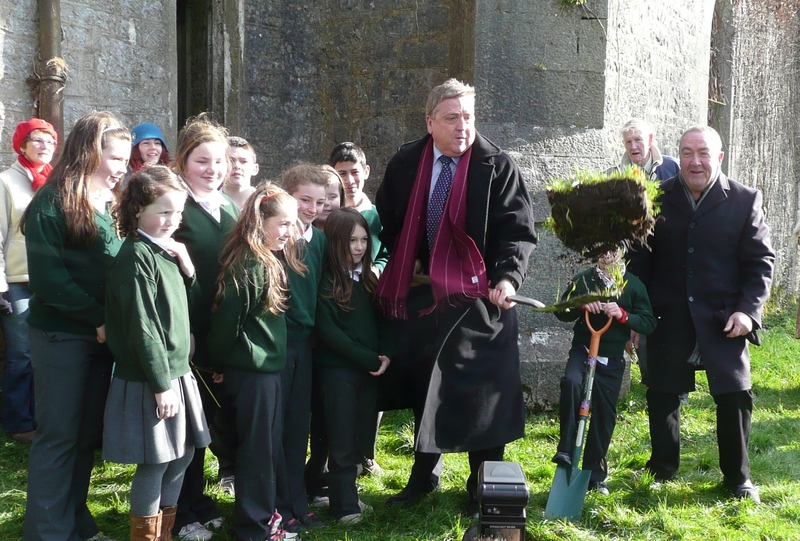 The sod was turned by Pat Breen T.D. on March 11th 2013. Below are updates on the construction as it happened. Construction work began before the end of March with the removal of the slates from the roof. The slates were removed under the supervision of the Parks & Wildlife ranger to ensure that any resident bats could be relocated safely to the temporary nesting boxes located in the trees on-site. Work is well underway in the Cultural Centre. The roof is almost completed with the original slates back in place. Approximately twelve percent that were broken have been replaced by similar “Killaloe” slates which Taaffe Construction purchased at a salvage yard. Unfortunately they are a slightly lighter colour because they were not as weathered as the original slates that were on the roof, but they will blend in over time. Three inches of specialist condensed insulation has been installed under the slates. We were lucky with the condition of the original 200 year old roof timbers, only one rafter had to be replaced. All other timbers were in good condition. 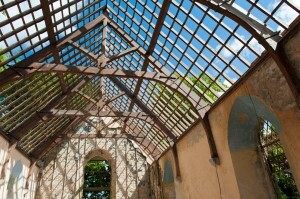 The existing rafters (traditional church style) will be a feature of the internal of the new centre. Work on replastering the internal walls with lime plaster has also commenced. The sub floors are poured, the steel work and floor joists for the mezzanine training room is almost complete. The extension to the building has been constructed. The first fixing for the electrical installation is complete in the extension and progress on the extension roof will be worked on over the next two weeks. The ESB and Telecom services are ordered, the road cutting licence for Telecom and the Pedestrian Crossing has been applied for. At this stage the completion of the Restoration project is in sight. The roof and insulation is complete and the painting of the ceiling and the staining of the rafters are in progress. The under floor heating system and the radiators in the upstairs training room is complete. The mezzanine floor is complete although the sliding door is yet to be fitted. 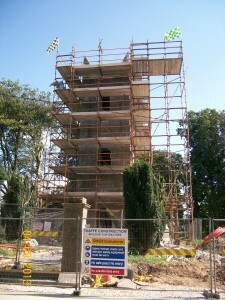 The final coat of lime mortar is due to be completed in the next two weeks. The main structure of the extension including the roof has been completed. The electrical first and second fixing is almost complete. The tower has been re-pointed and a new roof and internal floors are complete. Work has commenced on the external boundary wall and paths. Two new ESB poles now replace the one pole adjacent to the gate. The new windows and external doors are fitted. Weather permitting; we should see the project come close to completion within the next six weeks. Unfortunately Ireland suffered severe storms during January & February 2014 which lead to significant delays in the connection of the electricity and this had a knock on impact on progress on our project. The external limestone cladding is currently being installed on the extension. Doors & windows have been installed throughout the building. The electricity supply has been connected and this has allowed us to commission the heating system. Second fix electric work has been completed. The internal walls and floors of the extension are now ready for painting to begin. The interal doors have now been fitted. Work has begun on the completion of the ground works with the installation of paths & kerbs. The installation of the external limestone cladding on the extension was completed. The internal walls and floors of the extension were painted. The ground works including the installation of paths & kerbs has been completed and the grounds have been landscaped. Internally, the kitchenette & bathrooms have been completed fitted out. The restoration of the existing building has been completed. The internal walls were painted and wooden wainscotting has been installed on the lower section of the internal walls. Timber flooring has been laid throughout the existing building and also in the Mezzanine Level. The external stonework was cleaned and sealed to prevent dampness entering the building. 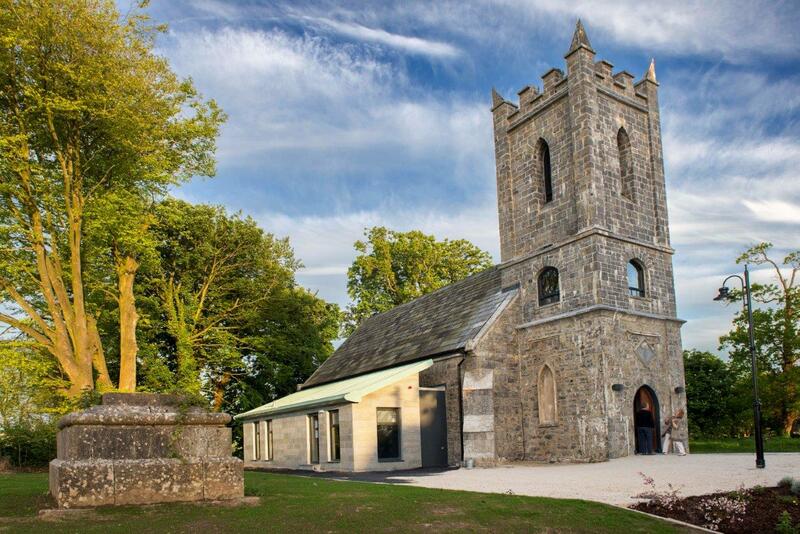 Sunday May 11th 2014 day was a landmark day for the the project as it was finally possible to open the doors to the public and hundreds of people from Kilkishen and surrounding areas were given the opportunity to visit the new centre. The feedback was unanimously positive and everyone was very happy to see the results of the 13 month month construction project. Following the completion of the Cultural Centre in the past month, a number of events were run since mid-May. Two concerts, an over 50’s Exercise Session, 2 Education Classes and a Fun Science class have all taken place in the centre. The events have been very successful in getting good attendance and the feedback has been very positive. The Centre is now open for viewing, Monday to Friday from 11 am to 1 pm and all are welcome to drop in. 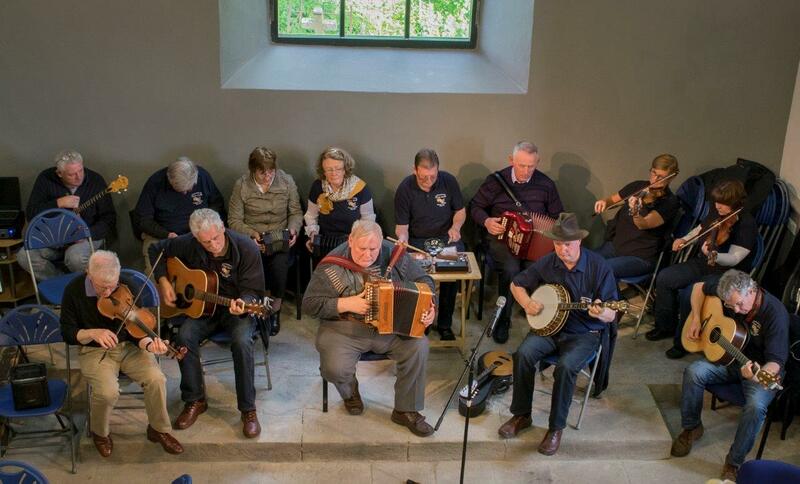 A full programme of events is now being prepared for the autumn programme and the committee are now taking bookings from Organisations and individuals wishing to use the Centre for concerts, community activities and meetings for the autumn and winter seasons. For bookings contact Mike Hogan, 086-2314685 or Olivia King, 086-8680593. This project has been part-funded by the LEADER programme, through the National Development Plan and by the European Agricultural Fund for Rural Development. 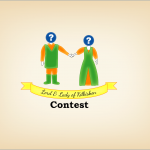 The community needed to fundraise for the balance of the cost of the project. A fundraising committee, under the chairmanship of Patsy Neville and reporting to the Development Association, was set up to source this local funding in April 2011. This committee put a plan in place to raise the necessary funds and this plan was launched in August 2011. The committee raised approximately €150,000. 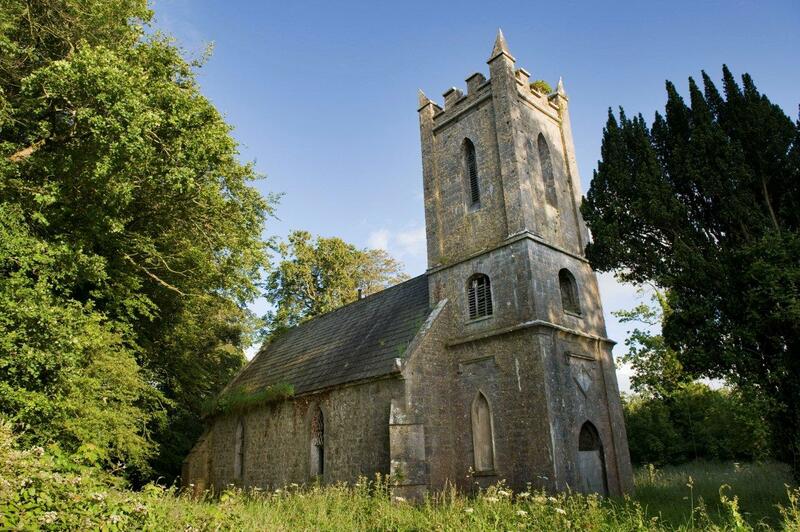 To find out more about this project, to see the proposed floor plans, or to learn how you could help fund this project you can view the Kilkishen Church of Ireland Restoration Project August 2011 Newsletter pdf.